Christopher Dartnell. By kind permission of Sheila Dartnell. 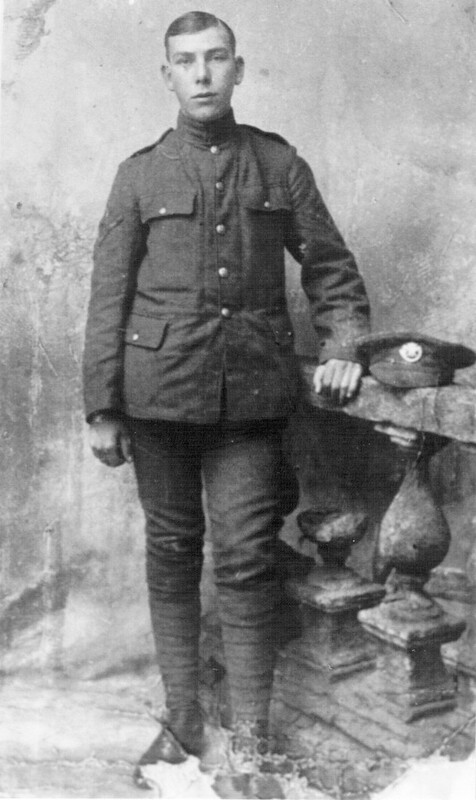 Chris Dartnell volunteered for military service shortly after the start of World War One. 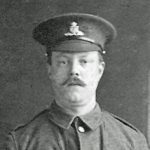 He was part of what was known as Kitchener’s volunteer army formed from the volunteers in 1914 and 1915. 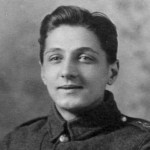 The medal roll confirms that he was awarded the 1914/15 campaign Star together with the British War Medal and Victory Medal. “The Battalion was in Brigade Support (to the 10th Battalion Durham Light Infantry who were in the front line trenches) and were quartered in Sanctuary Wood in Dugouts and Shelters about J13 C.5.7.” During the night 15/16th the enemy shelled the portion of the wood the Battalion were occupying with Gas Shells and High Explosive shells. He also again shelled the Wood very heavily from about 9am to Dusk. A&C coy’s carried up rations to the 10th DLI and our B” coy, leaving the wood at 5.30pm in parties of 20 under an officer. Casualties other ranks 4 killed 7 wounded”. Alongside Christopher’s grave are the headstones of 3 other NCOs, all having been killed on the night of 15/16 October 1917. …My next vivid memory was War being declared in August 1914. My brothers, Roger, Jim and Fred were called up and transported to France and India. My father was called to repair the Hospital ships and was often in France for a month at a time. His trade was plumbing. It was frightening when the Zeppelins came over and dropped bombs and you wondered if you might be killed when they came your way. We very often stayed and sheltered in the underground where the trains were stationary until All Clear was sounded. Next to be called up was my brother Chris, when he was 18. He hated war and violence and often wished he was not in the Army. 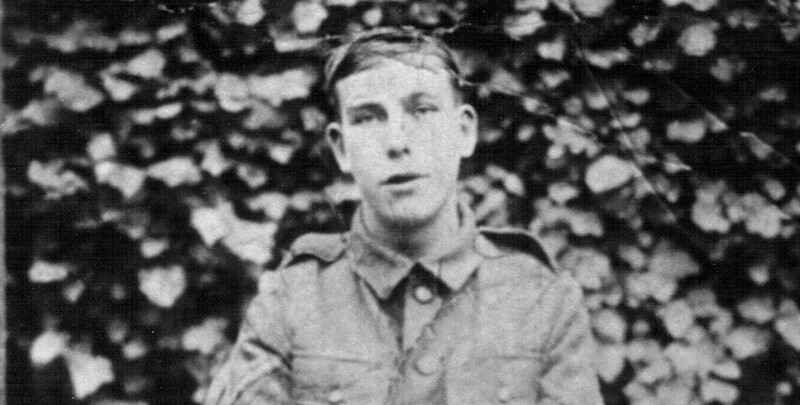 When he had leave from France he never wanted to go back after his leave and the last break he had from the trenches he didn’t go back until after another day had passed. That was in 1917 (May). 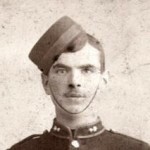 We then had a telegram to say he was killed in action in October – he was just 21. 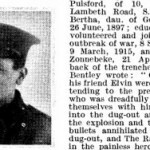 We all were very shocked because of this and the news that my brother Bill had been wounded in German East Africa and was on his way home having been shot in his right hand and had lost a thumb and was also wounded in the right hip. So he was out of soldering for good. He became a Commissionaire for a firm in the City of London. 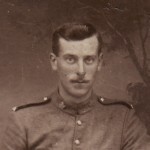 My last brother, Reg was called up when he was 18 in January 1918 and sent to France for the big push in May 1918. 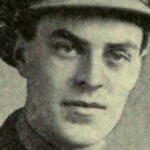 We had a couple of cards from him the first few weeks and then no more news until August that he was a prisoner of war. 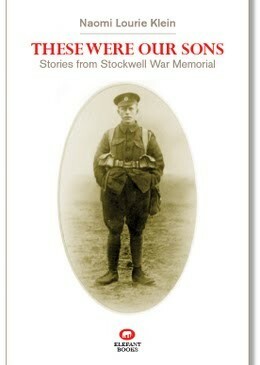 Thank goodness they all arrived home except Chris, safe and well after the war ended in November 1918. Then Armistice was declared in November 1918 and we were told to go home at lunchtime. I remember going to see the masses of people gathering in the Strand, London and felt lost in the crowd. People dancing and cheering and drinking. I had to walk home as there were no buses running. When I reached my house my Mother was crying because her son, Chris, had been killed and would not be returning and my other brother Reg was still a prisoner of war and we were still waiting to hear if he was still alive. The 1901 census gives the Dartnells’ address as 34 Hartington Road, so either they moved from No 24 or 34 is a transcription error. 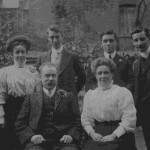 In 1891 the Dartnell family were living at 34 Hartington Road. Frederick and Jane Dartnell and their (then) four children lived with Frederick senior’s mother Eliza Dartnell, 62, who was born in Chelsea. In addition, there was a married couple lodging with them – Richard Chamberlain, 58, a general labourer, and his wife Martha, 57, both born in Lambeth. 1881 Before Frederick married Jane, he lived at 34 Hartington Road with his parents, Edward J Dartnell, a 56-year-old compositor born in Lambeth, and Eliza, 50, whose birthplace is given as “Westminster” (rather than Chelsea as in the 1891 census). Frederick, then 18, was working as a carpenter (he later became a plumber) and his sister, Harriet, 16, was a dress-maker. lived in Spring Grove, Lambeth.